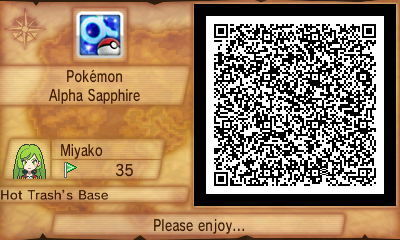 Since in Pokemon Omega Ruby, and Alpha Sapphire Secret Bases are shared through QR codes, I thought it would be a good idea to put ours here if you wanted to share it! Just save your QR Code to your SD Card and upload it here if you wanna share your secret base! DONE FOR NOW ANY UPDATES WILL BE IN THE SAME SPOT I SWEAR. YEAH, THAT's WHAT I THOUGHT U SAID.